Real Madrid lost a big opportunity to shorten Barcelona’s lead as they draw 2-2 against Valencia on Sunday. 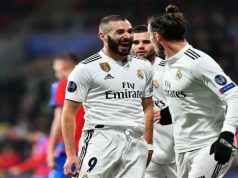 After taking the lead thanks to a great goal from Karim Benzema and seeing Daniel Parejo level, Los Blancos suffered a big blow as Mateo Kovacic was shown a red card in the 68th minute. Gareth Bale managed to level, but Valencia equalised just one minute later. Both teams could have earned the three points in some final minutes of total madness, but the missed their chances. The visitors had the first chance of the game as Gareth Bale drove down the left and set up Benzema, who found Danilo, but the Brazilian’s strike was just over the bar. Los Blancos took the lead in the 16th minute. Ronaldo pulled off a lovely flick that found Benzema. The Frenchman charged into the box and rattled a superb shot that found the bottom left-hand corner of the net. The hosts improved their game and had several chances to level. Cancelo met a brilliant cross from De Paul, but then headed wide of the post. Minutes later, Andre Gomes danced into the penalty area and missed from close range. De Paul was brilliant in the build-up but failed to beat Navas. In the last minute of the first half, Pepe brought Gomes down inside the box and the referee pointed at the penalty spot. Parejo rolled his effort into the bottom corner to make it 1-1. Both teams were at a similar level of strenght until Mateo Kovacic was sent off after putting in a terrible challenge on Cancelo. 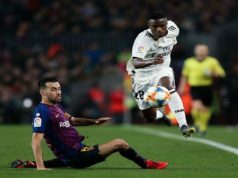 Valencia started dominating possession and Alcacer was close to scoring, but his effort just rebounded wide of the post. Real made it 1-2 in a free kick as Bale rose above everyone to meet a delivery from Kroos and angled a header into the top corner. 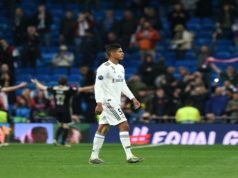 However, Los Blancos defence showed a terrible lack of concentration one more time allowing Valencia to level just one minute later. Rodrigo beat Ramos and sent a header towards Alcacer, who found the back of the net. Both teams were exhausted but made an incredible effort in the last few minutes to earn the three points. Bale missed a couple of chances and Navas denied Negredo to maintain the draw in the scoreboard.